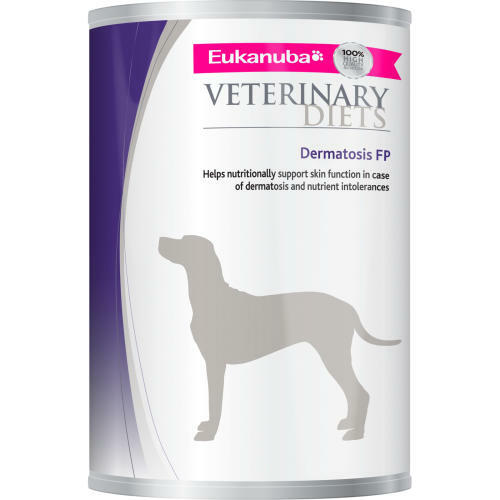 Eukanuba Veterinary Diets Dermatosis FP is a tasty, complete pet food for adult dogs, specially formulated to help maintain and repair skin and nourish the coat. Ideal for dogs suffering from a range of inflammatory skin conditions, food allergies, pruritic dermatitis such as flea bites or contact with irritants, or older dogs whose metabolism of glucose may be impaired. Also suitable for managing gastrointestinal disorders such as vomiting, colitis, gastroenteritis, or inflammatory bowel disease. A recipe of fish and potato provides less common sources of protein and carbohydrates, minimising the likelihood of adverse reactions, whilst a tailored ration of Omega 6 and Omega 3 fatty acids helps to nourish and mend your pet’s skin. At the same time, FOS prebiotics and beet pulp help promote the balance of friendly bacteria in the stomach for optimal digestive health and stool quality, whilst the crunchy kibbles with antioxidants help to keep teeth strong and clean and fortify your canine companion’s immune system. Please note, Eukanuba Veterinary Diets Dermatosis FP is not suitable for dogs which are allergic to fish or potato. Catfish, herring meal, modified potato starch, maize oil, dried beet pulp, calcium carbonate, potassium chloride.